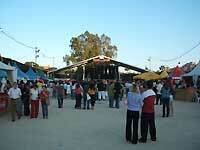 The Fair of the Nations is a month-long event in the Turia river-bed that promotes cosmopolitan Valencia. It is an open-air lesiure ground where you can buy ethnic souvenirs, try a variety of cuisines and hang around with Brazilians or Mexicans in open-air bars, while watching music acts. Although the number of nations represented is quite large, it is still more or less a Latin American fair, than any other. Spain simply doesn't have any other immigration that comes in such numbers and with such influence. You will notice that a good half of all the stalls, bars and visitors (as well as most performances) are Latin American. Other countries tend to be generally under-represented - German sausages and Australian burgers will be generally sold by Spaniards and Ukrainian jewelry boxes by Peruvians. There will be a pavillion with shopping stalls and an open-air yard surrounded by food and drink bars. The yard will also have a stage for performances. 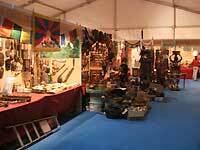 The pavillion will be filled with stalls offering souvenirs, crafts and ethnic household items. You can buy silver rings from Mexico, jewelry boxes from Ukraine, statuettes from Senegal, buddhist accessories from Tibet, fabrics from India and even a sarcophagus from Egypt. There were over 20 countries represented on the stalls in 2006. The prices are not bad at all and you can find a really good bargain. The bars in the yard will serve you genuine Argentinian steak, Mexican nachos, Australian kangaroo burgers, German sausages and many more varieties from all over the world. There will also be a number of regional Spanish stalls. You also have a wide choice in alcohol - from authentic Brazilian capeta to a first-ever tequila and imported German beer (or a 1 euro Equadorian beer for those on a budget - from the lady on Equador stall in the pavillion). In the evening, these bars are a great place to socialise with the natives of whatever country's patch you are visiting. The prices on food and drink are fairly high, so if you are not into spending much don't come too hungry. Most performances take place on weekends and tend to be Latin American. It could be a Colombian pop star, a Cuban blues band or a Brazilian dance group. There will also be occasional dance classes. We will update you on 2007 programme as the fair comes near. The Fair takes place throughout May. The exact dates will vary, a few days later or earlier, depending on how the finishing weekend falls. We will update you on the exact dates for 2007 as the event comes near. The Fair is open every day of the week from 11am to 11pm on weekdays (+Sundays) and midnight on Fri and Sat. That's when the gates close, but the activity goes on for another hour or more. The fair also closes for siesta - from 2pm to 5pm. Weekday entry is free but on weekends (Friday included) you pay a 5 euro entry, since this is when the performances will take place. By the end of the fair there is usually a prmotion to attract more visitors - flyers that admit two persons for the price of one. Some performances are special and will charge separately - from 12 to 15 euros. They will be indicated on the programme.